The debate is over and all those who do not sign-up to the Al Gore view that global warming is a crisis and is caused by man-made CO2 are to be banished, shunned and driven out of their jobs and positions of public exposure. Here in Virginia, no better example could be used than that of Prof. Patrick Michaels, a distinguished scientist and faculty member at VT and UVA who has been personally attacked by Gov. Kaine and who has even been banished from appearing before the governor’s climate change commission. We haven’t seen anything quite like this since the Pope isolated and vilified Galileo. And now the University of Colorado is falling in line with the Gore-machine with their treatment of Prof. Bill Gray, the most experienced and qualified hurricane scientist and forecaster in the USA. A pioneering expert on hurricane forecasting says he may soon lose funding due to his skepticism about man-made global warming, according to a report in the Houston Chronicle. Dr. William Gray, who once said that pro-global warming scientists are "brainwashing our children," claims that Colorado State University will no longer promote his yearly North Atlantic hurricane forecasts due to his controversial views. Gray complained in a memo to the head of Colorado State’s Department of Atmospheric Sciences that "this is obviously a flimsy excuse and seems to me to be a cover for the Department's capitulation to the desires of some (in their own interest) who want to reign [sic] in my global warming and global warming-hurricane criticisms," the Chronicle reports. School officials denied that Gray’s stand on global warming was an issue, and said that they are cutting back on media support for his forecasts due to the strain it places on the school's lone media staffer. "It really has nothing to do with his stand on global warming," Sandra Woods, dean of the College of Engineering at CSU, told the Chronicle. "He's a great faculty member. He's an institution at CSU." In the fall of 2005, Gray passed lead authorship of the yearly hurricane forecasts to his former student Philip Klotzbach, but he continues to head the Tropical Meteorology Project at CSU. CSU will continue to publicize Gray's yearly forecasts as long as they are co-authored by Klotzbach, officials told the Chronicle last week, but will end their support if Klotzbach, who recently earned his doctorate, moves to another institution. "It seems peculiar that this is happening now," Donald Wright, a professor on public relations at Boston University, told the Chronicle. "Given the national reputation that these reports have, you would think the university would want to continue to promote these forecasts." One friend said Gray's views highlight the politically charged atmosphere that surrounds global warming research in the United States. "Bill Gray has come under a lot of fire for his views," former director of the National Hurricane Center Neil Frank, currently chief meteorologist at Houston's KHOU-TV, told the Chronicle. "If, indeed, this is happening, it would be really sad that Colorado State is trying to rein in Bill Gray." The Chronicle noted that Gray's views on global warming had become increasingly personal, with characterizations of former colleagues and students who disagreed with him as "medicine men" and a "Gang of Five" conspiring to promote the idea of man-made climate change. Gray contends it's all a hoax contrived by scientists hungry for research funding, media professionals thirsting for Pulitzer Prizes and foreign powers seeking to create a single world government. In fact, he says, the warming cycle will soon end, and the Earth will begin a period of temporary cooling. Jeremiah Wright was welcomed (4/27/08) to the meeting of the National Press Club with a rousing standing ovation; this after a warm reception by the mayor of Detroit and receipt of an award by the Detroit NAACP. Instead of trying to somehow explain or atone for his radical, racial, hateful sermons, Jeremiah chose to expound upon his vile positions as proper and appropriate and proposed that anyone who is disturbed by or speaks out about his behavior is against black-churches! The real underlining and very disturbing problem that has been revealed here is the attitude and behavior and beliefs of the Detroit NAACP, the mayor of Detroit and the National Press Club. In defending Wright, these people have publically proclaimed that they support his views and statements that are very similar to the radical Muslim Madras schools that have resulted in violent behavior by many Muslim-terrorists. In this country we have seen similar behaviors from the followers of Malcolm-X the Black Liberation Army and Louis Farrakhan. Jeremiah Wright should be shunned until he rejects racism and hatred, not applauded and praised. That’s what happened to David Duke and the KKK and that is what should happen to all those who follow that destructive path. In conflict with the editors of the Roanoke Times and their friends at the DNC and the ACLU, the Supreme Court has ruled that states and the federal government may require that voters provide photo-ID when voting. AP Story: WASHINGTON — The Supreme Court ruled Monday that states can require voters to produce photo identification without violating their constitutional rights, validating Republican-inspired voter ID laws. In a splintered 6-3 ruling, the court upheld Indiana's strict photo ID requirement, which Democrats and civil rights groups said would deter poor, older and minority voters from casting ballots. Its backers said it was needed to deter fraud. A “splintered ruling”! Only the AP and their associates would call a 6 to 3 vote splintered. Others would call it a clear mandate for fair voting and elections. How is it democratic and fair to have people voting who are not eligible to vote? It takes ID to buy beer! It takes ID to buy cigarettes! It takes ID to get on a plane!But requiring ID for voting is not OK? Why would left-wing liberals want persons to vote who are not eligible to vote? A $300 million dollar “Mass Persuasion Exercise” has been launched by Al Gore’s organization, “The Alliance for Climate Protection”, in order to influence public opinion about man-made CO2 impacts on global warming and climate. This major propaganda effort is based on a UN group’s (IPCC) hypothesis that man-made CO2 is causing a global warming and climate crisis. However, the IPCC states in their documentation that there is NO scientific proof that man-made CO2 causes global warming or climate change. Instead, they (the IPCC) rely on an ever evolving consensus of opinion that their latest conjecture is scientific fact. As I listen to all the media-talk about young people registering as Democrats, I remember that I became a Republican after looking at all the deductions listed on my first pay day check-stub. Attached from an unknown author is another lesson that might apply to those who have not yet earned their first pay check. Father-daughter (son) talk.... A young woman was about to finish her first year of college. Like so many others her age, she considered herself to be a very liberal Democrat, and among other liberal ideals, was very much in favor of higher taxes to support more government programs, in other words redistribution of wealth. She was deeply ashamed that her father was a rather staunch Republican, a feeling she openly expressed. Based on the lectures that she had participated in, and the occasional chat with a professor, she felt that her father had for years harbored an evil, selfish desire to keep what he thought should be his. One day she was challenging her father on his opposition to higher taxes on the rich and the need for more government programs. The self-professed objectivity proclaimed by her professors had to be the truth and she indicated so to her father. Her father responded by asking how she was doing in school. Click- on each of the following two links to view my view of the key issues and primary objectives of this Commission that has been sent to each member. It appears that there’s nothing like getting with your soul-mates in a fund-raising situation in which you think your words are never going to see the light of day to say what you really feel and think! It also appears that Obama said what he thought Barbra Streisand, Michael Moore, Ted Turner, George Soros and the other elitist fat-cat community of radical left-wing anti-American extremists in California would like to hear? I have a life-time hunting-fishing-big-game license in two states and I have been both a Deacon and an Elder in my Christian Church. About the only thing I’m bitter about is the way most of the media has degenerated into a highly biased left-wing propaganda mess. In 1982 Ed Koch, mayor of NYC, ran for governor of NY. At some point he publicly commented that small-town upstate folks were so simple that all they did was drive their pick-up trucks down town to Sears to buy Searsucker suits. Koch lost the election primarily by loosing big the upstate vote! Perhaps small-town folks are smarter than some “sophisticated” people give them credit for! Today, on April 14, 1865, while watching a performance of "Our American Cousin" at Ford's Theater with his wife, President Abraham Lincoln was assassinated from a gunshot wound to the back of the head at point-blank range by John Wilkes Booth. History has been very kind to Pres. Lincoln, but not so those who were his contemporaries in both the north and the south in the media and the body politic. Surely when news of the shooting spread, over half of the country celebrated. Today’s actions by the Democrat party and most of the media relative to Pres. Bush and the Iraq War and the War with Radical Islam is very similar to the environment Pres. Lincoln faced from 1861 until his death. To the sea by Sherman. List of generals, searching for a leader who could win by out-killing the opposition. Given how nicely historians have treated Pres. Lincoln, I wonder how history will view Pres. George Bush and his distracters. Roanoke Times, 4/13/08, Pg A12: Government text draws high school student’s fire for conservative bias. Some stuff in the book is just plain wrong says a NJ teen. Agreeing with the teen is The Center for Inquiry at Amherst, NY, think tank that promotes science and which has issued a scathing report about the textbook. Since when is stating facts a “conservative bias”? The global temperature for the past 100 years published by NASA shows less than one (1) degree warming during the past 100 years and no warming during the past 10 years. Also well established data that the IPCC publishes is that 95% of the greenhouse effect is caused by water-vapor and that man-made CO2 contributes less than 5% of 5% which is approximately 0.25%. 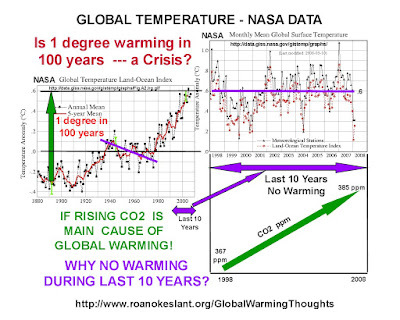 It would appear that the Center for Inquiry should inquire into the NASA 100 year temperature data and into the IPCC data on the amount of greenhouse effect that can be attributed to man-made CO2. Perhaps a real “think tank” would do that! It also would appear that the “they say” who are quoted as the source of the stories’ label of “conservative bias” is another gross slant by the AP and their friends at the Roanoke Times. Perhaps the RT and their friends should publish the facts and leave the “they say” in the clippings on the editorial floor where they belong and present headlines in a factual manner. Something about professional publishing and editing that is taught in journalism 101. It is amazing that Sen. Obama, who presents himself as the new and improved generation of young leaders, could even be in the same room with Al Twana Sharpton. We are known by the friends we keep and in this case the association paints a very poor image of Sen. Obama who should be repudiating Sharpton and everything he represents! A direct quote by Sen. Obama to Gen Petraeus during senate hearing on Iraq war status. “Yet Another Obama Audacity of Insulting Our Intelligence Again”! “Nobody’s asking for precipitous withdrawal”? Where has this guy been for the last 3 years? Apparently his amnesia is so bad he can’t remember his own public statements! Did this guy forget to take his medicine or what? Is this the “change” he has been preaching? Roanoke Times,3/28/08, Pg Va 1 & 4: Toxin levels higher than reported. A seven (7) column expose' on new news about Radford Arsenal TOXIC chemical releases. I had to read through six columns of really scary descriptions of these horrible TOXINS before I found out that they are primarily nitrogen and nitrates. Nitrogen is 79% of the atmosphere and nitrogen and nitrates are the primary content of fertilizers aren't they? Those are the primary products put into the soil by legumes and crops like alfalfa aren't they? Al Gore and our government now think that CO2 is a toxic substance. That's what we breath out and green-plants breath in isn't it? Why is it so easy to become cynical about what's going on these days? By the way, if you know of anyone who has ever gotten ill or died from PCB's or DDT or formaldehyde, please send me their name.